Chicken korma is an extremely popular dish. 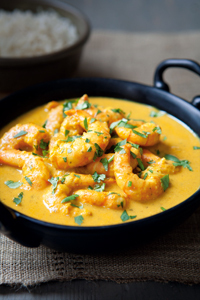 Make a change and swap your poultry for prawns. The results are delicious. 1 Heat oil in a medium non-stick saucepan and stir in the onions, garlic and ginger. Cover with a lid and cook the onions and garlic over a medium heat for 10 mins until pale golden brown, stirring occasionally. 2 Remove the lid and stir in the curry paste. Cook for a further minute, while stirring, then add the water and bring to the boil. Lower the heat slightly and simmer for 8–10 mins, uncovered, until the liquid has reduced by half and the onions are very soft. 3 Remove the pan from the heat and, using a stick blender, blitz to a smooth sauce. Stir in the cream and sugar, season with a little salt and put the pan back on the heat. 4 Add the prawns, bring to a simmer and cook for 3–4 mins, stirring, until the prawns are completely pink and beginning to curl. 5 Sprinkle over the coriander, stir and serve immediately with a small portion of rice. Recipe extracted from the NEW book The Hairy Dieters Eat for Life by Si King and Dave Myers. £14.99. ebook £7.99 Weidenfeld & Nicholson. Why not attempt another curry recipe? One pot lamb curry – ready in under an hour!